Concerns raised after revelations that Palestinian Authority police regularly serve neighborhood technically under Israeli control. Residents of a Jerusalem neighborhood have been calling the Palestinian Authority (PA) police forces to fight crime rather than the Israeli police, IDF Radio reports Sunday, raising concerns over the neighborhood's allegiances. The Kafr Aqab neighborhood is perceived as an Israeli Jerusalem neighborhood - not part of the PA - as most residents pay property taxes and are entitled to vote for mayor and city council, despite living beyond the security fence. The Jerusalem municipality is charged with the education and infrastructure in the neighborhood, and despite the fact that it is located beyond the Qalandiya checkpoint, the Israeli police is supposed to protect the security of its citizens. Nevertheless, neighborhood residents report that when there is a conflict between families, or drug trafficking, they tend to call the PA police forces to enforce the law, and that they usually arrive in civilian clothing. Former municipal officials confirmed the story, as well as the chairman of the local residents, Munir Abu Ashraf. "When we had a problem and could not deal with, we ordered the Ramallah Palestinian police come to help us," Ashraf said. "They come and help sometimes. They also come dressed in ordinary civilian clothes rather than in uniform." "Is it against the security of the State of Israel that they come in uniform and arrest a drug dealer?," he asked. Residents complain that even if they were interested in contacting the Israeli police, they are not actually able to do so, as the Israeli Police are banned from entering the neighborhood for security reasons. Despite this, critics claim that the entry of Palestinian police into the neighborhood constitutes a blatant and unequivocal violation of Israeli sovereignty over its territory, since the neighborhood is noted as part of its municipal boundaries of Jerusalem. Jerusalem Councillor Dov Kalmanovich (Jewish Home) said that is unacceptable that the PA violate this understanding, particularly against the backdrop of the hullabaloo surrounding the terrorist releases. "Introducing other forces who impose order in Jerusalem is a blatant move against the Israeli police," Kalmanovich stated. "I call on the Israeli police to continue to enforce its sovereignty even in Arab neighborhoods of Jerusalem." The IDF spokesperson's office, meanwhile, denied that the Israeli police have been ordered to stay away from the neighborhoods behind the security fence. 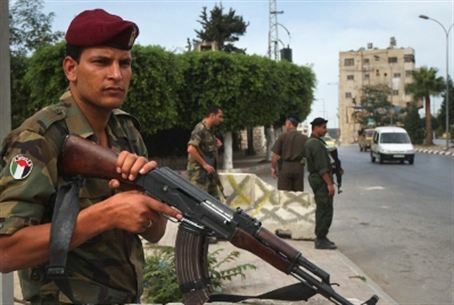 "The Israel Police works in Kafr Aqab, and can enter the neighborhood with the approval of the IDF," it said. This is not the first time the PA police have replaced Israeli authorities in an Arab neighborhood on that side of the fence. Several months ago, PA police were found to be regularly operating in the "no-man's land" between Israel and the PA land on the other side of the security fence, and even conducted a large-scale drug bust there.